Is anyone else as obsessed with soups and stews as I am? I absolutely love a big, cozy bowl of something hot on cold days (or even on hot days) to nourish my body and soul. Mmmm. We love soups and stews so much in our house that we make a big pot of something at least once a week during cooler months. It’s a great strategy for “meal prepping” without actually having to meal prep, because we usually get at least 2-3 days worth of lunches or dinners with one batch. I’m so lucky that my husband loves soup and stew as much as I do, and he has a few good recipes up his sleeve, too. That means some weeks I get 2 nights off of cooking when he makes a pot of stew! Growing up my dad didn’t like to eat soup for dinner often, so I’m enjoying having a household that does. 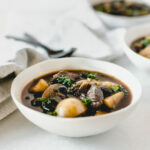 One of his favorite stews I’ve made recently is this slow cooker red wine mushroom beef stew. It’s so incredibly easy to make, and is full of nutritious ingredients like iron-rich beef, vitamin-D filled mushrooms, and antioxidant-packed red wine. And it’s just so darn comforting. Unlike many people, I actually love cooking a big pot of stew on the stove, so I normally do with this and every other soup and stew. It’s very relaxing to me, but I know most of you are super busy and need the convenience of the crock pot, so I’m trying to listen and bring you more convenient recipes. 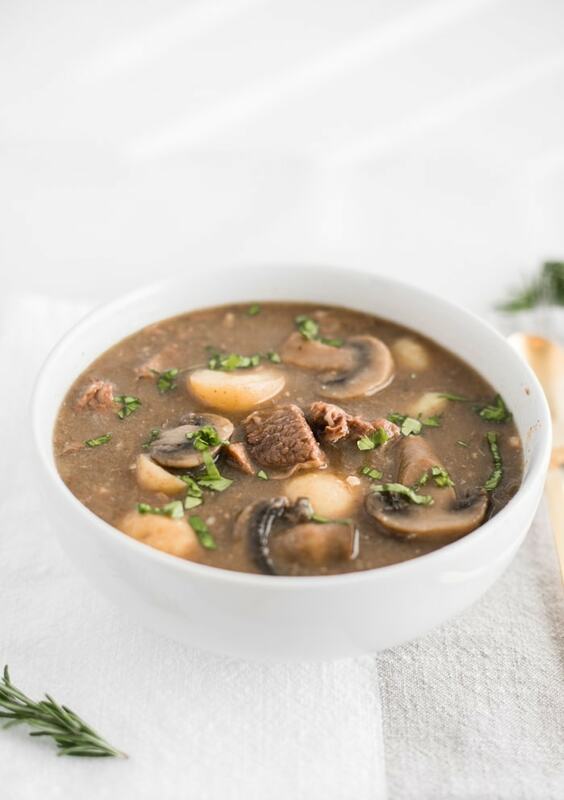 But if you love watching and big pot of stew simmer on the stove like I do, you can totally make this slow cooker rosemary red wine mushroom beef stew on the stove top as well. If not, I hear you. Proceed with the recipe as written and enjoy. 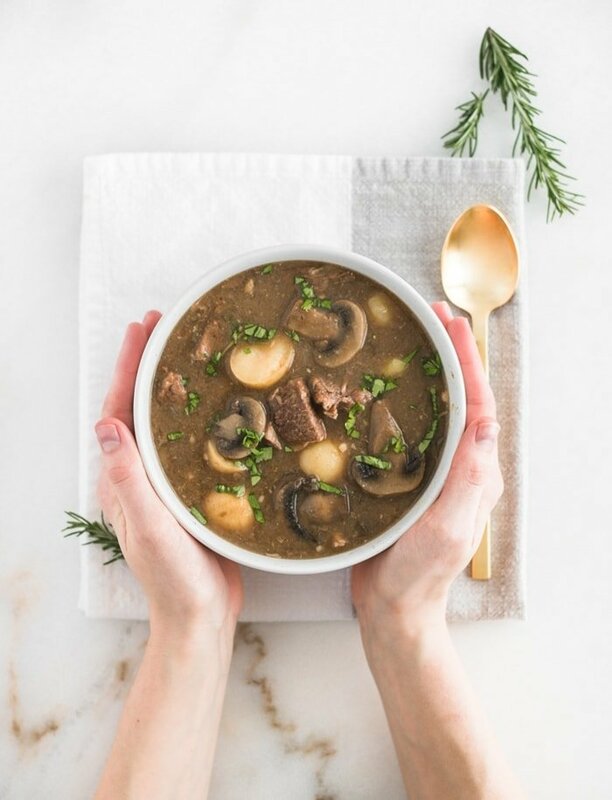 All you need to do for this delicious slow cooker rosemary red wine mushroom beef stew is brown the meat and cook the onions and garlic a bit before adding them to your slow cooker with all of the other ingredients, then set it to cook on low while you go to work or run errands, and you’ve got a complete meal ready for you when you get home! I like to serve this hearty stew with a chunk of freshly baked whole grain sourdough bread for dipping in the delicious broth, but that’s totally optional (kind of). Either way, this stew is sure to fill your belly and make you feel all warm and fuzzy inside! Place rosemary and bay leaf in the bottom of your slow cooker. Heat oil in a large skillet over high heat. Pat beef dry and season with salt and pepper. Add beef to skillet and sear on all sides, about 5 minutes. Add beef to slow cooker. Turn heat to low and add garlic and onions. Cook 2-3 minutes. Add wine and deglaze skillet, scraping up any browned bits. Pour into slow cooker with the beef. In a small bowl, stir together balsamic and cornstarch. Add to slow cooker with broth. Stir. Close lid and cook on low 6-8 hours. Crack the lid the last 30 minutes or so to let the stew thicken. Remove bay leaf and rosemary before serving. Heat half of the oil in the bottom of the Instant Pot on ‘Sauté’ mode set on high. Pat beef dry and season with salt and pepper. Brown in two batches in the Instant Pot. Remove meat from pot. Add remaining oil, onions and garlic, and sauté 5 minutes. Add beef and remaining ingredients to the pot, reserving balsamic and cornstarch for later. Close and lock lid, seal vent, and set to ‘Pressure Cook’ on high. Set timer for 20 minutes. When timer is done, let pressure release naturally for 5-10 minutes before carefully venting steam. Open lid and return to ‘Sauté’ mode on low. Stir together balsamic vinegar and cornstarch. Stir into stew and let thicken with the lid open 10 minutes. Remove bay leaf and rosemary before serving.